John William Henry Norman was born in Balderton in 1895. His mother, Mary Louisa Norman was an unmarried servant who (in 1891) had been working in Basford, Nottingham. She died in 1899, aged 25 and John was brought up by his grandparents, John and Sarah (Sally) Smith. In 1901 they were in Woodbine Terrace, Balderton. John had been born in Balderton but Sally was from Littleport, Cambridgeshire. After John (the grandfather) died (probably 1902) Sally moved to Main Road, Long Bennington. In 1911 she was there with a son George and 4 of her grandsons, including John William who was 15 and working on a farm. By 1914 he was working for Mr Ablewhite, grocer, of Long Bennington. He volunteered for the Lincolnshire Regiment, Lincolnshire Regiment in Jul 1916 and, after training at Saltfleet and leave in Oct, he was sent to France with 1/5th Battalion in Nov that year. 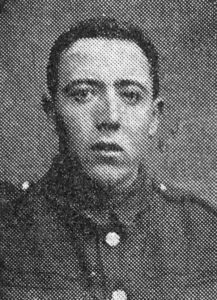 He died on 19th June 1917, aged 21, during an attack on Lens, towards the end of the Arras Offensive. After 2 days rest the battalion had moved back into the front line on the evening of the 18th and went ‘over the top’ at 2.30pm on 19th. They lost 14 men killed in action and 4 others died of wounds. John now has no known grave but is listed on the Arras Memorial, as well as the Long Bennington war memorial.